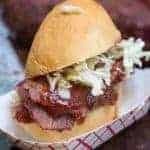 What is better than Prime Rib? A smoked and grilled Traeger Prime Rib, that’s what. 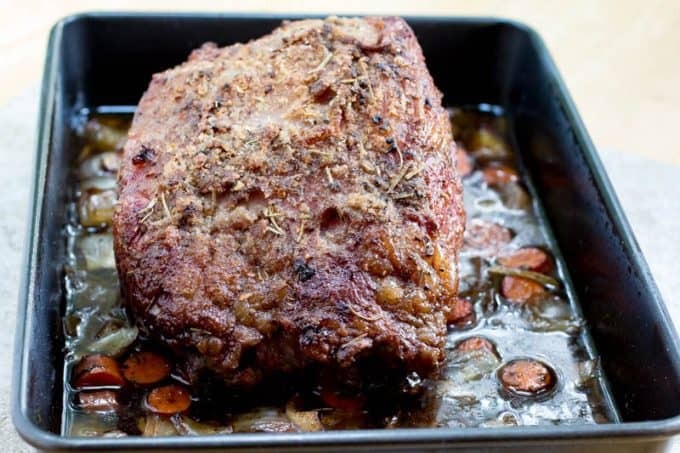 This boneless rib roast is seasoned with rosemary, salt, pepper, and garlic, and cooked in a pan with mirepoix and au jus. 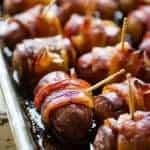 You’ll never go back to the oven version once you try this Traeger recipe. If you’ve ever been in the kitchen on a holiday and have lamented about not having double ovens, let me just stop you right there. You don’t need double ovens if you get a Traeger. I was slow to jump on this particular bandwagon, but I’m officially sold. You can do SO MUCH with these grills. It isn’t just a smoker, either. It is a grill and can be used as an OVEN as well. We’ve made everything from bacon to turkey, and salsa verde to fajitas on that thing. Update, we even make our own Traeger beef jerky and it is the BEST JERKY I HAVE EVER HAD. 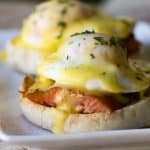 You think you like smoked salmon? 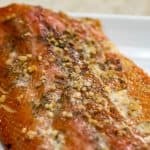 You have no idea how good smoked salmon can be until you taste it fresh off of a wood-pellet grill. I love wood-fired anything, and pellet grilling is so much more convenient than charcoal or campfire cooking. 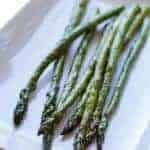 It tastes SO much better than cooking on a gas grill. I don’t even like food cooked on gas grills anymore, I’ve been so spoiled by this ultimate grilling machine. Why? Because I get alllll the good cookin’ from my husband of things like this prime rib on a Traeger. Can you smell that?? Because I still can. 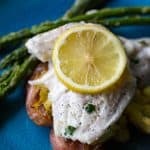 This is a super easy recipe. As in, even as a novice griller I would’ve been totally comfortable throwing this together and sticking it on the grill, and I’m not typically a griller. Thankfully though today I didn’t have to. I love the weekends. Sleeping in and long lunches and time for shopping and relaxing and recharging. Mine usually go something like, work – cleaning – laundry – dishes – fighting kids – endless to-do lists – emails – photographing *something* – lock myself in my room for an hour or two for some quiet. 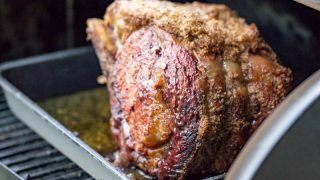 How Long Does it take to smoke a prime rib? It depends. Never go by TIME when cooking a big roast. Always always always go by temp. That’s the only way to get consistent results. 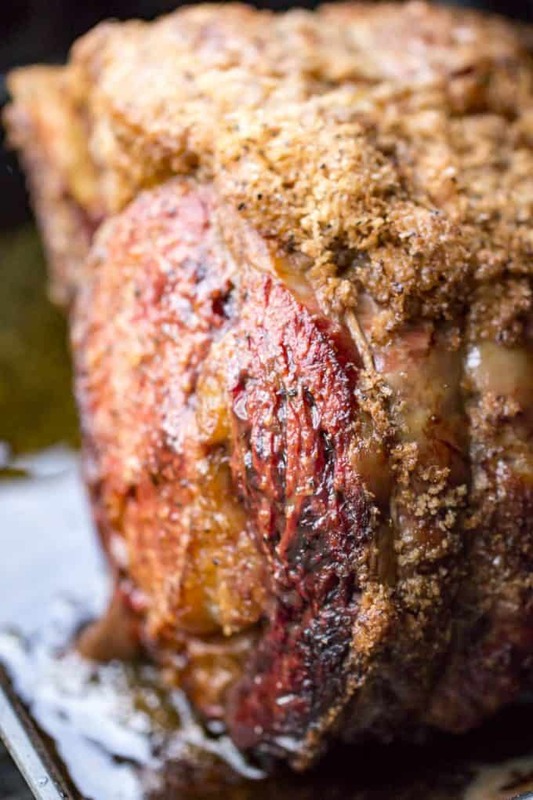 For a medium-rare roast, pull it when the roast reaches 1170-120 degrees. It’ll continue cooking for a bit even after you pull it, so for that delicious color don’t leave it too long on the grill. 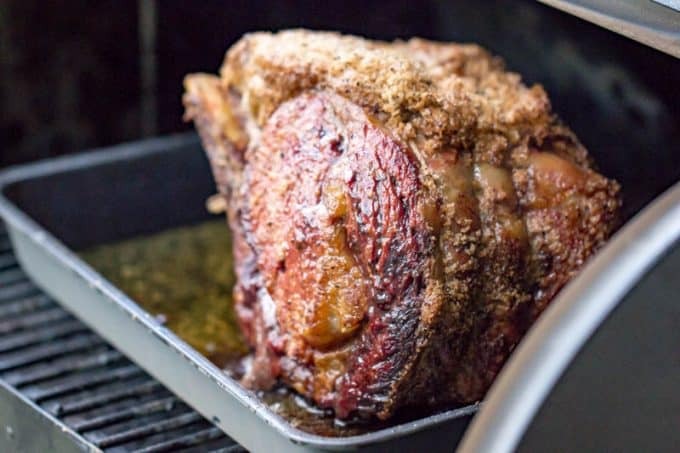 What is the best wood to smoke a prime rib? We really love the Traeger Gourmet blend, but I’ve also used Hickory and Cherry pellets with great success. Use what you have, and it’ll be delicious. 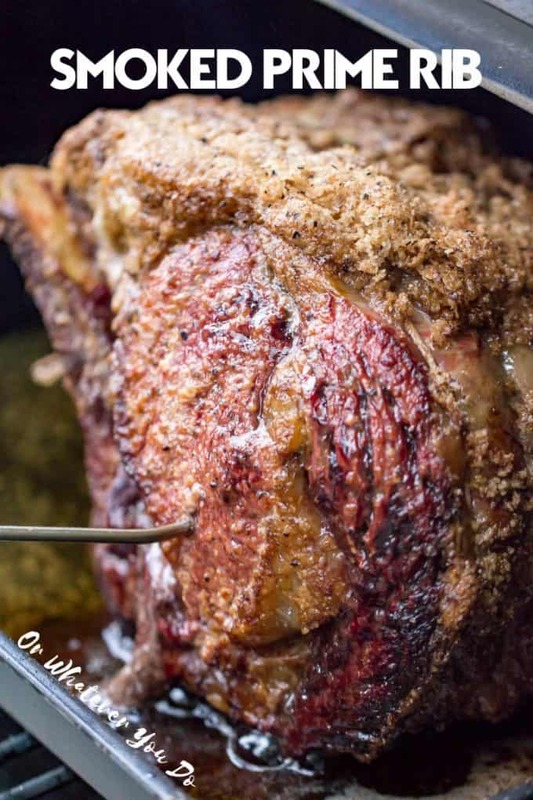 What Temperature is best for smoking a prime rib? We like to smoke ours at 250° for about an hour, and then crank it up to high until it reaches 120° inside using an internal probe. The end pieces will always be more done than the middle pieces, especially if you are cooking a very large roast. 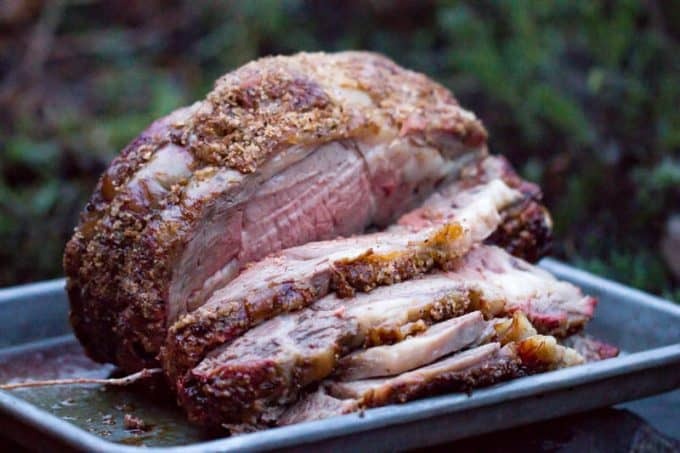 You’re going to find a LOT of different opinions on this out there though, and most of them will most likely be some degree of “right” and will result in a delicious smoked prime rib. Do your thing! 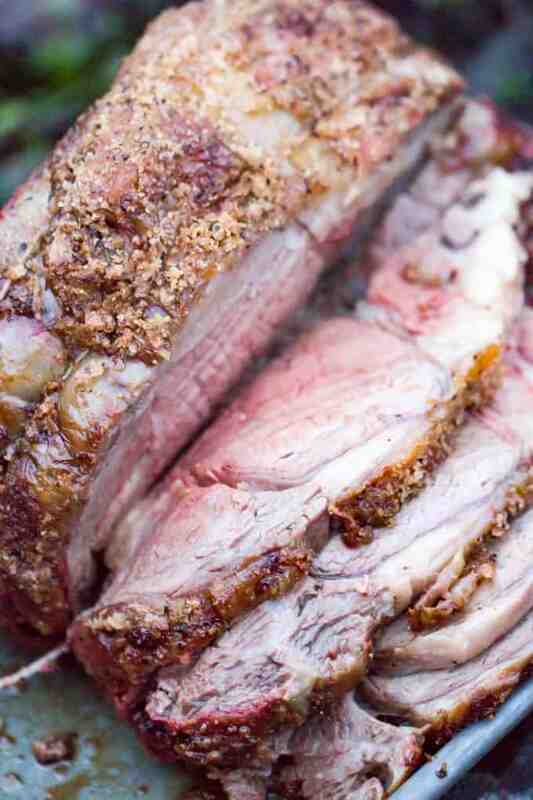 As long as you pull the roast when the internal temp reaches 120 you’re going to love it. What if I Don’t Like Medium-Rare Prime Rib? If you aren’t a fan of medium-rare prime rib, I promise I won’t give you any crap about it…unless we are in person. Then all bets are off. 😉 But really – you have some options if you like a rib roast that is cooked a little more. Cook it a little longer. Pull the roast at 130 if you want the entire thing to be a little more towards medium & medium-well. Still pull it at 120°, but give it a 30 second bath in some hot au jus right before servings. 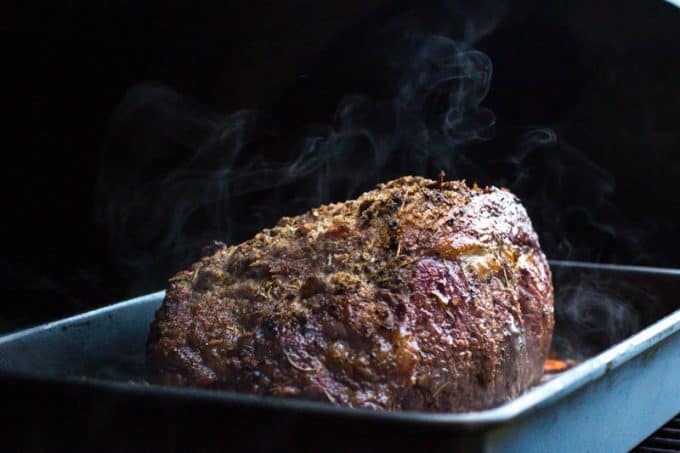 Pull at 120°, but sear individual slices of rib roast in a blazing hot cast-iron skillet on the stovetop. Take the roast out of your oven at least an hour before cooking. Preheat your Traeger to 250°. 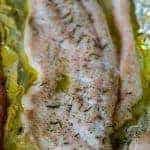 Mix the salt, pepper, onion powder, garlic, and rosemary in a bowl and mix it all together with a spoon to create your rub. Coat your entire rib roast with the rub. Make sure to use it all. After the rib roast is coated, set it aside. Next, combine the onions, carrots, and celery in the bottom of a 9" X 13" high sided cake pan. Place the rib roast on top of the vegetables in the cake pan. Put the pan with the roast in it onto the center of your pre-heated Traeger. Cook at 250° for one hour. After one hour, pour the two cups of beef broth into the bottom of the cake pan. Turn your Traeger up high and let it cook until the internal temperature reaches 120°. Pull the roast off of the grill when it hits 120° and let it rest for twenty minutes before slicing. 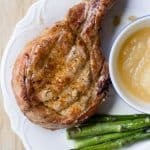 Pour the juices from the bottom of the pan through a strainer, skim the fat off of the top, and use the remaining juice for your au jus. This post is not sponsored or endorsed by Traeger. We just love their grills and use them alllllll the time. We post what we cook, around here. Besides the frozen pizzas, that is. There ARE affiliate links in the post, however, and in most of my posts. If you click through and buy something using one of my affiliate links, I’ll earn a few pennies to a few dollars, and it won’t add anything to your purchase price at all. These photos just made my mouth water. Thanks for sharing the details, I’m definitely going to try and make it myself! Thanks, Kelly!! I appreciate that! Let me know if you try it!! I made the prime rib. And it received rave reviews from our guests. We served salt jacket baked potatoes and sauteed kale. Put the potatoes in on the 2nd hour temp increase. Pulled meat at 130 degrees. Let roast stand while potatoes finished 15 minutes. Great! Thanks so much for stopping by and letting me know! Whatever we have on hand. I, personally, don’t notice a huge difference between the pellet varieties. Any difference or preference on bone in or no bone? 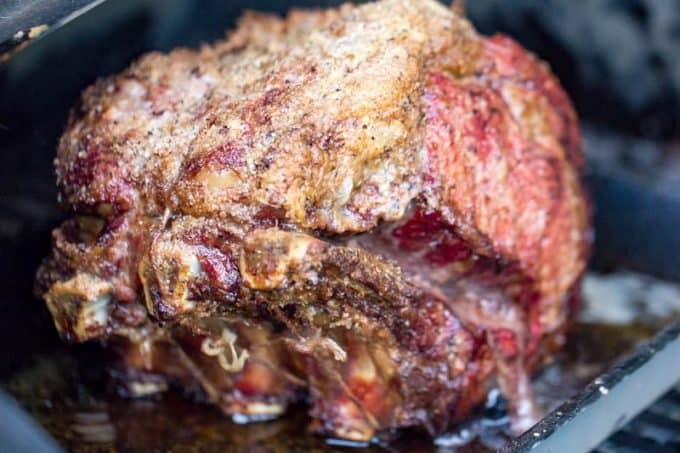 People say the bone lends more flavor to the end result, but it is prime rib so there’s a whole heap of flavor there regardless. Personally, I prefer with the bone because we slow roast them until the meat is fall-off-the-bone tender, and then I use them in soup broth too which is one of my favorite things, ever.